Recorded as early 1870s, but marked on the 1872 OS Map, the range of buildings along the east side of Loanfern appear to have been built together. The building at the centre, now home to the JSMTC, was built as the Mechanics Institute for the Quarrymen. It was later used during the First World War as a Drill Hall. The cottages total 20 properties, which were built for the quarrymen and whilst they have been adapted to modern standards, would have been some of the better quality properties in the village when built, with two (three?) rooms and a scullery at the rear. A similar block are Lochside Cottages at the West Harbour and they also appear on the 1872 map. The hall at the centre of Loanfern, behind the square, was originally flanked by wings on both sides of the central clock tower. However, that to the south has since been demolished. The Village had, for many years, two schools, being the county school which is still in use, albeit very much extended, in School Brae and St John’s Episcopal Church School further down West Laroch, and now converted to a private home. They were both built between 1875 and 1879 as far as can be ascertained. This shows a substantial oversubscription to the County School, just a few years after it was built, and also that both schools had as many if not more pupils than the village school has today. Prior to the new schools being constructed, there was an Episcopalian schoolhouse within the Banks Church at the head of the east harbour, amongst the quarrymens cottages, recorded as early as 1854. St Brides Episcopal Church and Manse were built in 1874/5 and designed by J Gordon Brown. 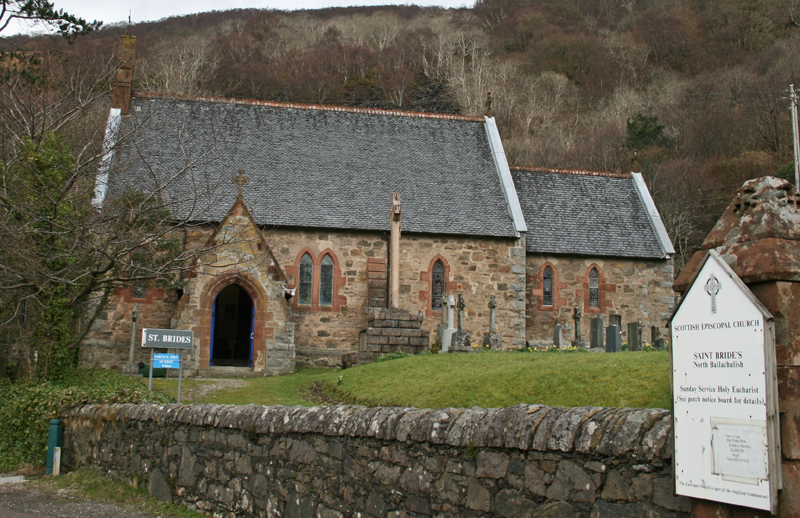 Nether Lochaber Church of Scotland was built in 1901 (some records suggest 1911), to replace the older church at Creag Mhor which was becoming unstable and was demolished in 1900. The future Bishop of Argyll and the Isles (consecrated in 1883), James Robert Alexander Chinnery-Haldane bought Alltschellach House on the shore of Loch Leven in North Ballachulish in 1876. It is not entirely clear if he purchased the current, presumably recently built, property, or if he bought an older house by the same name and had it replaced. It is known that work was being done in the grounds in 1880 when a carved wooden figure no less than 5 feet tall and since known as the Ballachulish Goddess was found by workmen in the grounds. The Bishop died at the house in 1906. The property is now owned by HF Holidays, a group which can trace its origins back to the Co-operative Holidays Association. Although undoubtedly not the first Inn or Hotel on the site, the main part of the Hotel building and stable yard which we see today dates back to 1877 and was designed by John Honeyman. 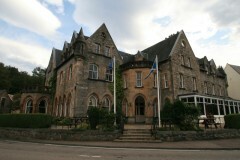 It has, of course, been substantially extended in 1996, and is now run, along with the Isles of Glencoe Hotel, by the Crieff Hydro group. Barrs Stores opened in 1880, although it is believed that the building is a little older. This building remained in use as the villages main store until 2014. For most of its life it was Barrs Stores, which in the past comprised of (at various times) a general grocers, hardware store, drapers, and butchers, amongst other outlets. By the 1980s it was a franchised Spar store, competing with the SCWS Co-op store which had opened on 1/12/1945 and stood where the Quarry Cottages holiday lets now are. In February 1997 the Co-op bought Barrs Stores and moved in, before moving to the new store on 13/2/2014 and so marking the end of an era, over 130 years after the shop originally opened. Barrs Stores also opened and ran a store in Kinlochleven for many years. Indeed, this was the first shop in the new town built around the Smelter. A single record suggests that they also operated a shop in Glencoe at one time. Part of the Ballachulish Barrs Stores has since reopened as the Quarriers Kitchen Fish & Chip shop. The so-called Ballachulish Goddess, a five foot tall wooden figure was discovered in November in the grounds of Alltschellach House in North Ballachulish by workmen digging foundations for a wall. The figure is made of Alder, with quartzite pebbles fixed in place as eyes, and has been carbon dated to 600BC. Although yet to reach its maximum, the output figures for all of the Slate Quarries in Ballachulish added together, as listed in 1882, was 28-30,000 Tonnes or 16-17 million slates as an average over the preceding few years. It is also noted that there were 11 miles of rails in the quarries, although it is not clear whether this was literally the mileage of the rails, or of the tracks (ie two rails, so 22 linear miles of rail). It has to be remembered that it was another 20 years before the railway arrived in the village. This was the maximum number of sailings, between July and September. In May, June and October most of the sailings only operated 3 days a week, with the 6.15 from Oban and 8.45 from Banavie not sailing at all outside the peak months. Craiglinnhe House was built as the Quarrymasters House for Kentallen Quarry, away from the noise and bustle of the quarry itself. However, it seems to have been sold on reasonably quickly, as it was the MacMillan Temperance Hotel around the turn of the century, before being converted to a fever Hospital before the First World War. It remained as a hospital, latterly for infectious diseases, until the newly formed NHS sold it off in 1956 due to issues regarding the water supply. It is now a guesthouse with expansive views out across Loch Linnhe. St Brides Episcopal School in North Ballachulish was built in 1886 to cater for the growing community. The school had a single classroom and one teacher. The Ordnance Survey maps from the 1870s show that there were already 3 schools in the Onich and North Ballachulish area. One stood near the Onich Hotel, another which survived until the 1970s is now a private home next to the village hall, and a third stood next to the old church at Creag Mhor. This last may have closed when St Brides opened as it is not shown on later maps. 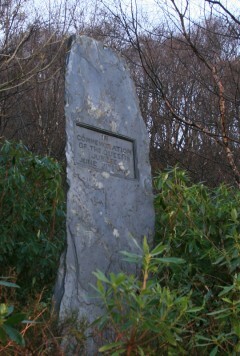 The Jubilee Slate was erected to the west of the village to mark Queen Victoria’s Silver Jubilee. It is likely that the Queens popular visit to the village just four years earlier inspired the villagers to subscribe to the memorial stone. 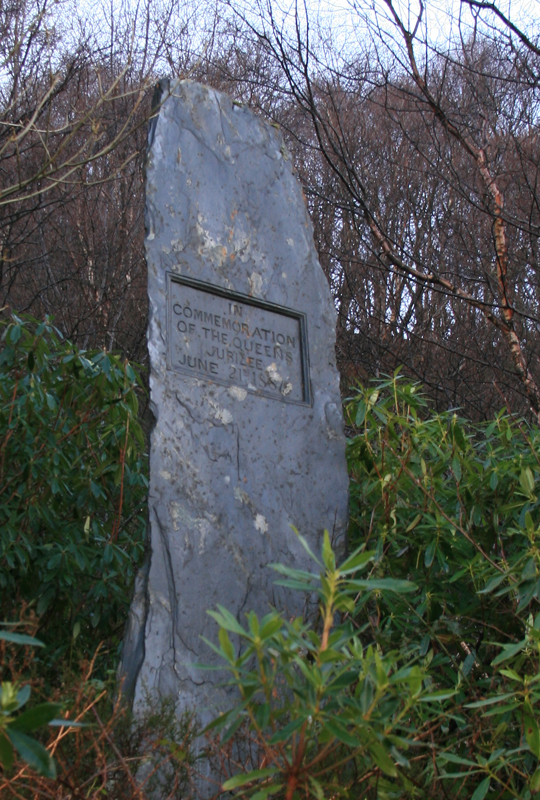 This slate is supposedly the largest single slab of slate ever taken from the quarries at Ballachulish. 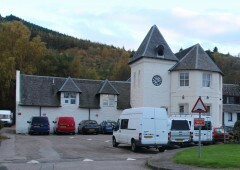 The Lord Advocate was asked about certain letters sent out to the tenants of the Barcaldine Estate by the new owner, who also owned the Ballachulish Estate. Whilst potentially circumventing parts of the Crofters Act passed the previous year, the owner was trying to get her tenants to stop any applications to the crafting commission regarding their holdings, in return for being allowed to stay put until they died at which point the land would revert to the estate. When they refused to do so, they were served with notice to quit. The Lord Advocate then explained that the notice to quit had been originally served when she took ownership of the estate, at which point the tenants served crofters notices on her. All but one case was resolved amicably, but the outcome of the last is not recorded. There was not thought to be any need to amend the crofters act. A series of questions were raised regarding a fence which had been erected across the pier at Ballachulish, which was set up to prevent all but one coach owner from accessing the steamer pier. Debate surrounded whether the fence was on the foreshore, and therefore illegal, or above high tide, the ownership of the pier, and whether a pier charge of 3d per passenger was legal or not. The replies suggest that the pier had been built by the Ballachulish Estate as a private development but without permission 30 years earlier. Therefore many ‘normal’ rules didn’t apply. It had been standing too long for any order to remove it to be made, but was deemed a private pier with public access at the owners discretion, therefore the government had no say over the fence or pier dues. This then raised the matter of a right of way, as free access had been granted for the previous 30 years. Sadly the final answers to this situation are not on record. Ballachulish Shinty Club were founded in 1893, and over the next 30 years they went on to win a series of the major trophies and competitions. The Secretary of State for Scotland was asked about the omission of the school at Ballachulish with regard to recent Secondary Education Grants. He replied that he had, and had rectified the situation to the county committee’s satisfaction. The board of the Callendar and Oban Railway approve the plan to build a line from Connel to Inverness via Ballachulish. Whilst this line was ultimately not to be completed, the decision paved the way for gaining an Act of Parliament for a line to Ballachulish. The Lord Advocate was asked about the dismissal of the schoolteacher from the Ballachulish School by the school board of Lismore and Appin. This was supposedly down to an unsatisfactory report by Her Majesty’s Inspector. However, the assistant inspector had had a complaint lodged against him, and parents had withdrawn their children from the school in protest. The Lord Advocate replied that he knew of the situation, that the dismissal of the teacher wasn’t necessarily connected to the inspectors report and that the complaint against the assistant inspector was caused by a misunderstanding. He also said that he was unaware that pupils had been withdrawn, but that the school was still receiving its funding until the situation was resolved. Two rival railways were approved on the same day. For the Callendar and Oban, a line was approved as far as the southern end of the Ballachulish Ferry, and for the North British a line was approved to the north side of the ferry. Both had initially tried to build a complete line between Connel and Fort William, but Westminster decided to offer a compromise situation, with no connecting bridge across the Ballachulish Narrows. Clearly, the North British never even started their line, and so there was never the need for a railway bridge across Loch Leven. It is unclear when the extension to serve the Quarries at Ballachulish was authorised in this or any subsequent act. The first sod is cut on the Ballachulish Branch line at Connel Ferry. Various routes had been investigated prior to settling on the final route as built, including crossing Loch Creran nearer its mouth between South & North Shian so as to better serve Port Appin. A station in Duror village instead of at Kiel had also been planned, and the original terminus as noted above was to have been at Ballachulish Ferry. The estimated cost prior to starting was £210,000 but while the final construction cost was higher, no figure has been found. Just 6 years after the club was established, Ballachulish win the most prestigious of shinty’s trophies – the Cammanachd Cup. The team went on to win again in 1901, 1911 and 1912, and were runners up in 1902 and 1948. Many of the players were quarrymen in the clubs early days, but as the quarry declined, so did the clubs fortunes.